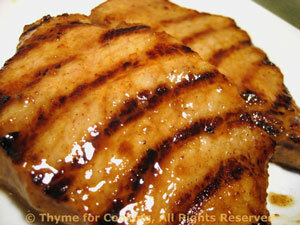 Dinner tonight: Pork Chops Diablo, Grilled. The chops I get are thin, around 1/4 inch (.6cm). I usually do 3. Try not to overcook pork as it tends to make it dry and tough, slightly pink in the center is perfect.